Marostica (pronounced with the stress on the second syllable) is a little town in the Veneto region of northern Italy, in the province of Vicenza. It is a picturesque place, located with the Veneto plain on one side and green hills to the north. Marostica's own hill is crowned with a large ruined castle; defensive walls descend to enclose the hillside and the town centre below in a protective embrace. Marostica bills itself as the 'City of Chess': every two years a medieval-themed festival is held here, when a giant chess game is enacted with human chess-pieces. This takes place in the town square, Piazza del Castello, where the paving marks out a huge chessboard. Marostica's principal tourist sights are the two castles, one at the top of the hill above town, the other in the main square, Piazza Castello. 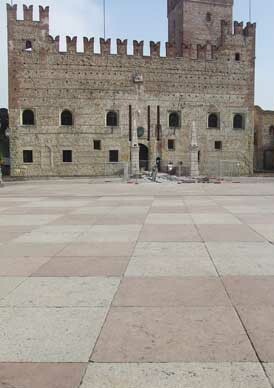 In the square itself you can see the chessboard laid out in paving stones, and admire the view up to the upper castle (Castello Superiore). The lower castle, the Castello Inferiore, guards the main entrance through the town walls. For four hundred years Marostica was ruled by Venice, and its dominion is recorded by a statue of the lion of St. Mark, Venice's symbol, in the piazza. There are a few interesting buildings and churches in Marostica which you can see as you wander the historic town centre. The best thing to do though, which will tempt visitors from the moment they see the town, is to climb to the upper castle. There is a road if you can't face the uphill walk, but if you travel by car you will miss the lovely green hillside. The main footpath up zigzags up the left-hand side of the lightly-wooded slope. It is fairly steep and you will want practical shoes, but it doesn't take long to reach the summit where there is a welcome tap of drinking water. There are benches en route, so you can rest and survey the town spread out below. 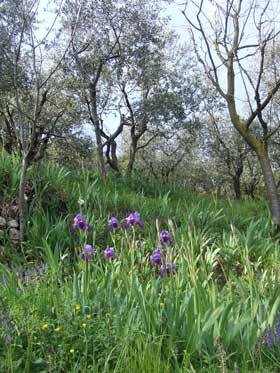 Smaller paths lead off to the right: it's worth exploring these to enjoy the semi-wild garden on the slopes. In spring, when I visited, this was a beautiful and peaceful place, colourful with many flowers including elegant irises. The castle is mostly ruined, but part of it houses an attractive restaurant which has a picturesque outdoors terrace and a garden within the castle walls. It is possible to climb up the walls, using steps where lizards bask, to a rather precarious short walkway along the battlements. The view over town is great, but I wouldn't recommend climbing to the battlements if you're nervous of heights. Although the path within the walls is very pretty, there is an attractive alternative route for the descent. If you follow the road which leads down from the castle, you will find the start of another footpath outside the walls. This is uncomfortably cobbled with rough stones, but takes a picturesque route through green cultivated terraces back down to Marostica. It is a great way to taste the countryside, admire the hills and feel far removed from the sprawling housing and light industry of the Veneto plains. The Chess Game (Partita a Scacchi di Marostica) takes place in even-numbered years on the second weekend in September. Tickets can be bought online in advance (see right-hand links panel). In odd-numbered years the town hosts a chess tournament instead. The story which is re-enacted during the 'living' game, which involves scores of costumed participants and human chess-pieces, is of a local ruler with a beautiful daughter. She had two suitors but rather than letting them fight a duel, the lord proposed a chess match with the winner receiving her hand in marriage and the loser marrying her younger sister (it is not clear whether she had any say in the matter). Other events hosted in town include a cherry festival in May and June, a summer exhibition of local crafts and an antiques market on the first Sunday of every month. Marostica has a little tourist information office with a permanent address in the Castello Inferiore, although when I visited it had relocated and was signposted a few yards from the main town square. You can find maps, brochures and advice on seeing the town, although it is so small you won't have any problem exploring it on your own. An hour and a half is enough to walk up to the hilltop castle, admire the views and descend again, but more time will allow you to visit the town's churches and relax outside a cafe on Piazza Castello. The most atmospheric place to eat in town must be the restaurant within the upper castle. There are other options in the main part of town, though, including several cafes in Piazza Castello. By train: The nearest railway station to Marostica is at Bassano del Grappa, five miles away. Buses connect the two towns. Bassano has direct train services to Venice, Padua and Trento. By bus: The nearest city, Vicenza, is best reached by bus. A company called Ferrovie Tramvie Vicentine operate a number of Marostica services, with fairly frequent connections to Bassano del Grappa and Vicenza. There is a useful bus stop for tourists just outside the city wall, close to the lower castle. Timetables are displayed on the stop, and tickets can be bought at a funny old-fashioned bar alongside. Bus times can be irregular so it's a good idea to plan your travel in advance checking timetables online (see our links panel) or displayed on bus stops. By air: The nearest airports to Marostica are Treviso Airport, served by Ryanair (as 'Venice Treviso'), Venice Marco Polo, and Verona. Bassano del Grappa is much larger than Marostica and is an attractive tourist destination with many more shops, cafes and things to see. Vicenza is famous for its architecture and is a lovely town to stay in or to wander on a long day trip. There are quite a few countryside villas and pretty small towns in this part of the Veneto, and on our Bassano del Grappa page we make some suggestions for local itineraries. 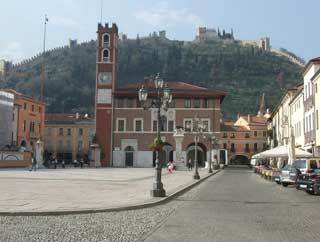 Marostica is more often visited as a day trip than as an overnight holiday stop. If you wish to stay in this area and you are using public transport, your best bet is probably to find a hotel in nearby Bassano del Grappa. If you are driving, you could take advantage of one of the nice countryside accommodation options in the surrounding area.